The rescueME range of products provides users with the latest technology specifically designed for compact size and ease of operation. This EPIRB is an Emergency Position Indicating Radio Beacon (EPIRB) for manual release only. 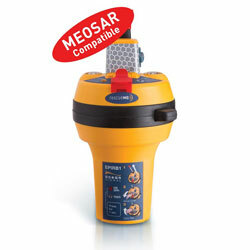 It is intended as a carry-off EPIRB, but may also be used as a supplementary alerting device as specified in SOLAS regulations. The rescueME EPIRB1 provides peace of mind with an impressive 10-year battery life. At just 7 inches (178 mm) by 3-1/2 inches (89 mm), this compact EPIRB can always be accessible, whether it's kept in an emergency grab-bag, life raft or in its quick-release bracket. A simple protective tab over the operating keys prevents inadvertent activation, yet allows for easy operation when required. The rescueME EPIRB1 also features two high-brightness strobes to maximize visibility in low light conditions. The retractable antenna provides maximum protection and a reduced outline for stowage. When required, the antenna is easily deployed with a gentle pull.